After each Patriots game, I'll be taking a look back at the film via NFL Game Rewind to take a closer look at what happened between the lines. Without further ado, here's what caught the eye from last night's preseason opener against the Saints. A deep group of young, talented players and the return of legendary OL coach Dante Scarnecchia always meant that this group would be amongst the most scrutinized on the team this summer. Thursday saw the group show some flashes to get excited about, but also featured some ugly moments that called to mind the line's disappointing performance last season. My biggest takeaway as far as the competition for interior snaps was the presence of second year man Shaq Mason in the starting lineup. Mason began camp on the PUP list and practiced exclusively with the second team upon his return, with Josh Kline and rookie Ted Karras getting most of the first team snaps at right guard. Mason only elevated to the first team in practice on Wednesday, a day before Thursday's opener, so it was a bit surprising to see him work exclusively with the "1s" under the lights. However, it could be indicative that the team views him as their starting right guard, which makes sense given his high upside as a run blocker. Ultimately, it was a bit of an up-and-down night for Mason. He flashed the athleticism and run blocking upside that has earned praise from Bill Belichick, with his open field cut block to spring James White's 56 yard screen standing out, but he also had some ugly moments in pass protection. Mason predictably struggled as a rookie in protection after coming in as an extremely raw prospect due to his option offense background. He looked like he still needed more work Thursday, as the Saints defenders (particularly Tyeler Davison and first round rookie Sheldon Rankins) repeatedly beat him to put pressure on Jimmy Garoppolo. There are certainly technique issues to work on with Scarnecchia, as defenders often managed to get to Mason's outside shoulder, creating a leverage advantage. Mason also seemed to struggle at times with the pure bulk and power of the 6'2, 309 pound Davison. Despite Mason's pass protection woes, he seemed firmly ahead of Josh Kline, who didn't get in until late in the first half. Kline played some reps at right guard before taking some center reps in the second half. Despite being the team's most consistent lineman last year, Kline could be settling into a utility backup role with this group, although that could certainly change if Mason doesn't improve in protection. There doesn't appear to be much competition at the other guard spot, where rookie Joe Thuney has stepped in and looked excellent since day one of camp. Thuney has earned raves from beat reporters throughout camp, particularly in pass rush one-on-ones, and he carried over that momentum with an excellent debut. He gave up just one pressure all night (a bull rush from the massive Nick Fairley) and otherwise held his own in protection, including some impressive reps against the supremely talented Rankins. Amidst an uneven overall performance from the line, Thuney stood out as easily the most consistent member of that group Thursday, executing assignment after assignment without trouble. The competition at center saw an interesting night, as David Andrews got the start but put out an inconsistent showing. He had his moments, including a nice block with 3:43 to go in the first quarter to spring Brandon Bolden for a solid gain, but occasionally struggled with the power of the Saints interior lineman. There were also several miscommunications that led to pressure during his time in the game and while it's impossible for us to know exactly who bears what blame there, it's reasonable to assume some of it belongs to the center responsible for calling out protections. Complicating matters was the presence of Bryan Stork, who came in during the second quarter and played well. Stork struggled in pass protection last year, but didn't get beat at all during his work Thursday while connecting on a nice second level block on White's aforementioned screen. At offensive tackle, the continued absence of Sebastian Vollmer led to Marcus Cannon starting at right tackle. Cannon has drawn the ire of Patriots fans quite often over the past two years, but he had an encouraging showing against the Saints, with his bruising down block to clear a path on James White's 2 point conversion standing out. While he allowed a pressure here and there, Cannon was far from the sieve he looked like last season while playing through a painful turf toe injury. It's not out of the question that he could have a bounce-back year under Scarnecchia. Remember, the last season Scar coached (2013) saw Cannon step up as a serviceable starting right tackle once Vollmer went down with a broken leg. The two years since have seen Cannon look awful while playing out of position at guard and through an injury that clearly affected his kick-step. Even an improved version of Cannon shouldn't be trotted out there on the blindside, where the Pats struggled for much of Thursday's game. Nate Solder played for the first time since tearing his bicep in Week 5 against the Cowboys and looked very rusty, giving up a sack to Kasim Edebali on the first third down the offense faced. That was the first of two sacks Edebali would collect against Solder, although the second one was more the result of Garoppolo holding onto the ball for far too long, allowing Edebali to eventually get by Solder on his third and fourth effort after being blocked well initially (in practice, the one-on-one rep would've been blown dead and gone as a win for the offense). Solder gave up several other pressures during his half of work and also got overpowered on an attempted run to his side. Fortunately, Solder has three more weeks to knock the rust off. He'll have too, as backup left tackle LaAdrian Waddle struggled with speed in the second half, getting beat around the edge on several occasions. One of the more interesting battles on the roster has been the one between second year man Justin Coleman and second round rookie Cyrus Jones for the third corner job. With Logan Ryan inactive (he has yet to shed the red no contact jersey in camp), it was tough to determine much depth-chart wise from Thursday, as both Coleman and Jones joined Malcolm Butler when the 1's went to the nickel. What was apparent was the physicality that stood out when evaluating Jones as a draft prospect. The rookie made his presence felt right away, out-muscling Brandin Cooks for the position that enabled him to recover a Mark Ingram fumble on the Saints first possession. Later on in the first quarter, Jones helped to win a fight on the goal line, keeping the much bigger Ingram from crossing the goal line. There was also an excellent back-to-back play sequence that saw Jones land a good thud on fellow second round rookie Michael Thomas, knocking the receiver out of bounds, before making an excellent open field tackle against running back Tim Hightower on the next play. Jones didn't get many opportunities to make an impact as a returner, but he looked like he belonged on defense. Perhaps inspired by the competition for his nickel job, Coleman also showed up with far more physicality than he provided last year as rookie. He landed a loud stick on Hightower after an incomplete pass early in the game, helping to set the tone, and also showed up by knifing in from the slot for a physical tackle in run support with 1:29 left in the first quarter. Coleman did have a tough night in coverage, allowing long completions to both Cooks and Thomas despite having pretty tight coverage on both plays. The coaching staff will certainly be working on his ability to locate the ball, as he had a chance to knock either pass away but was unable to come up with the play. With Butler, Ryan, Jones and Coleman all seemingly roster locks, the competition remains fierce behind them for what is probably only one roster spot. Veteran EJ Biggers appeared to be first in line following the roster locks, but his defensive night was marred by giving up a long play down the seam. Next on the depth chart was second year man Darryl Roberts, who had a tough night despite his obvious physical talent. Roberts gave up a chunk play by committing pass interference, as he clearly made contact with the receiver before the ball had gotten there. More discipline is needed from him, as he had good coverage but still gave up the play by committing the penalty. 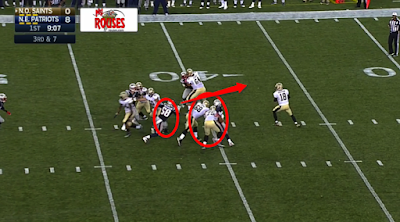 Roberts also seemed to let up for a second on a fourth quarter snap, allowing his man to get behind him after good initial coverage, and was fortunate that Luke McCown badly overthrew the open man in the end zone. The poor showings from Biggers and Roberts could open up opportunities for some of the undrafted competition behind them for depth roles. Jonathan Jones held up well despite getting tested several times, with a leaping pass break-up in the end zone against Thomas standing out. That play was particularly impressive given the size difference between the 5'9" Jones and 6'3" Thomas. Fellow undrafted rookie Cre'von LeBlanc also showed up with an impressive interception in the end zone, reaching back to secure a poorly thrown ball with one hand. LeBlanc was certainly deserving of his spot on SportsCenter's top 10 plays Thursday night. The Patriots suffocating defense was one of the stories of the game, and the first team was led by dominant performances from two of the team's key upcoming free agents. Jamie Collins was extremely active during his time on the field, coming up with an interception return for a touchdown and several tackles in the running game, including one where he flew a gap untouched to crush Ingram in the backfield. While Collins made the louder plays, it's possible that Sheard was more consistent, as he seemed to win his matchup time and time again regardless of whether the Saints ran or passed the ball. Appropriately enough, Sheard showed up with pressure that contributed to the rushed throw on Collins' interception, and he also created a turnover himself by ripping a fumble out of Ingram's hands on the first possession of the game. Both defenders look like they're on the verge of monster contract seasons for the Patriots, which for now is a very good problem to have. With long-time starter Rob Ninkovich going down earlier in the week to a torn tricep, the team's depth at defensive end was story going into Thursday's opener. The first team defense saw a rotation of Chris Long and Shae McClellin opposite Sheard, with all three defenders having some positive moments. Both players were active in run defense, with McClellin's quick penetration to bust up a run at the 12:25 mark of the first quarter serving as a highlight. They both had their moments as pass rushers as well, with Long drawing a hold after getting inside position against second year man Andrus Peat. However, the story of this group was the emergence of second year man Trey Flowers, who was dominant from the second he checked into the game. His strip sack, fumble recovery and touchdown return was obviously the highlight of his night, but Flowers was disruptive throughout his nearly three quarters of work. The second quarter alone saw Flowers break free for a pressure with a spin move (12:51 mark), shed a block to contribute to a stuffed run (5:10), make an alert read to sniff out a screen for a minimal gain (3:37) and draw a holding call on the tight end attempting to block him on the edge (1:14). He also flashed versatility, as his highlight worthy forced fumble and return came on an interior rush against a guard. One dime defense look even saw Flowers line up on the nose, with Long and McClellin rushing from the edge and hybrid player Kamu Grugier-Hill serving as the lone linebacker. The ability of Sheard, Long and Flowers to shift inside and rush against guards could be a big part of the defense this year, as we could see plenty of Giants inspired "NASCAR" looks featuring three defensive ends and one true defensive tackle on third downs. The 9:00 mark of the first quarter saw the Pats toss out an interesting look on 3rd & 7. 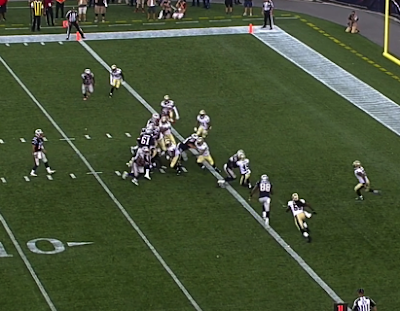 The Pats rushed four, with McClellin and Hightower lined up on the edge and Sheard and Long inside. They then ran a two man stunt, with Sheard angling hard outside to split the left guard and tackle, occupying both lineman to clear the way for McClellin to loop inside through Sheard's vacated gap. The stunt worked to perfection, as Sheard created pressure despite getting held by Peat. McClellin took advantage of the space afforded to him to come free up the middle, flushing quarterback Garrett Grayson from the pocket. Grayson's rushed throw bounced off the hands of running back Tim Hightower, who was popped right after the throw's arrival by Coleman to cap off a nice third down stop. Thursday was our first opportunity to see Tyler Gaffney in live action, as the third year running back has spent the entirety of his career on injured reserve. As expected, he got a decent amount of work in his debut, taking advantage of good blocking (particularly a powerful double team by center Josh Kline and guard Ted Karras) to take a third quarter carry 44 yards to the house. Gaffney showed good patience on that play, waiting for his blocking to develop before cutting back into space and outrunning pursuit to the end zone. That run did make for a misleading stat line, as Gaffney managed just 20 yards (2.5 ypc) on his other eight attempts. 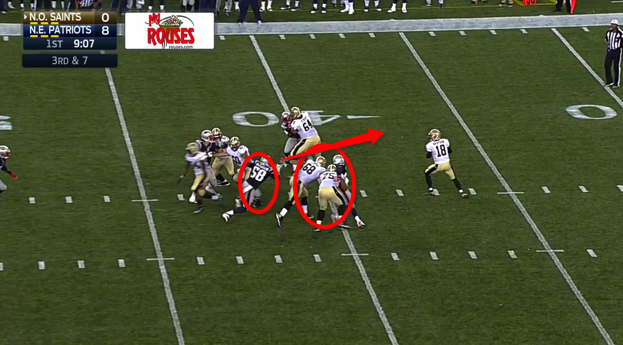 Much of that can be attributed to poor blocking up front, but Gaffney also showed some limitations as a runner. Despite his long run, Gaffney has just average speed and little "make-you-miss" wiggle to his game. 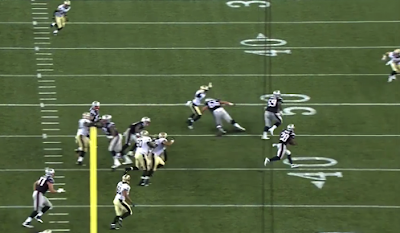 There are some similarities to Jonas Gray here, as Gaffney runs hard and will get what the blocking gets him consistently, but lacks the special ability to create extra yards on his own. He did, however, show up well several times in pass protection, something that can only help him as he attempts to win a job. The signing of Terrance "Pot Roast" Knighton got Patriots fans excited, as they remembered the dominant form he showed as a member of the rival Denver Broncos. However, Knighton has appeared to be behind not only Malcom Brown and Alan Branch but also fellow offseason addition Markus Kuhn on the depth chart in camp, and he validated that standing Thursday with an inconsistent effort. There were flashes of his obvious talent sprinkled in, including a drawn hold with 4:12 remaining in the second quarter, but far too many instances where he was moved far too easily for a man his size. With Brown, Branch and Kuhn all flashing solid play on Thursday, Knighton will have to turn it up to earn his role in the rotation. Special teams ability will go a long way towards deciding some of the close competitions for depth roles this year, so I kept an eye on which of the "bubble" guys were involved in the game's third phase. For example, Darryl Roberts might have had a tough day in coverage, but his involvement on the top kick coverage, punt coverage and punt return teams can only help his chances. Roberts came up with a tackle on a kickoff and has seen good reps in camp working as both a gunner covering punts and as a vice man on the return team, important jobs that require his high end athleticism. Speaking of important jobs, the personal protector on the punt team is responsible for quarterbacking that unit. 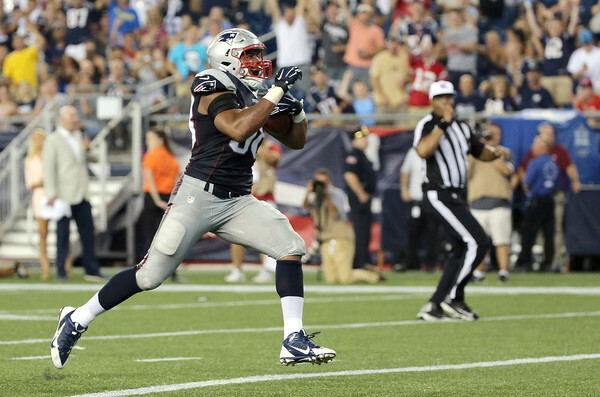 Normally manned by Olympics crossover star Nate Ebner, that role was filled by second year safety Jordan Richards. Richards was active throughout the special teams units, showing up with a hard hit on Marcus Murphy on a kick return. He was, however, part of a group of players (safety Brandon King was also guilty) that got sucked in and lost contain on Murphy's long punt return, a play which set up a Saints touchdown. Rookie Kamu Grugier-Hill projected as a core special teams player from the second he was drafted out of Eastern Illinois, and he was active on all four top units. "KG's" athleticism and aggression stands out whether he's on special teams or on defense as a linebacker/safety hybrid. Defensively, he seemed to be constantly around the ball in the second half. Both Trey Flowers and Geneo Grissom appear to be behind some veterans on the defensive depth chart (we'll see how much longer Flowers can be held back defensively), but both were active on special teams. Grissom has the look of a core player thanks to his unusual combination of size and speed, and he showed impressive hustle to run down Murphy from behind on the Saints long return. I love the aggression and motor Flowers plays with (he was part of the top punt coverage team), but he'll have to be more disciplined than he showed on a hit that should have been penalized, as the returner was already well out of bounds. Special teams have kept running back Brandon Bolden on the roster for years now (he's currently entering his fifth season), and they could be an extra factor in Gaffney's push for a job. Gaffney was part of the top punt coverage unit, but was part of the unit that lost contain on Murphy's big return. AJ Derby, who flashed his intriguing pass catching potential in the second half as a top target for Jacoby Brissett, also showed up in punt coverage, where his athleticism could make him an asset.